Learning potential is equally distributed. Access to leading universities is not. Every year, there are at least 3,000 ‘missing’ students from state schools who have the grades to get into the UK’s top ten universities, but who don’t go. When narrowing down to look at students from the most disadvantaged quintile, this number is still high, at 1,880 students per year. Low-income students tend to have lower acceptance rates than high or middle-income students. A government report from the U.K. in 2011 points to research that shows that there is something like a state school ‘penalty’ in the admissions process equivalent to one A-level grade. At Russell Group Universities in the U.K., students from low-income communities were 50% more likely to drop out than their peers at from high-income communities in 2010. Current university students want to help. Students care. They care enough to spend their free time on solving the problem. Through our peer-to-peer mentorship programme, our current-student mentors provide applicants with information, application feedback and support throughout the application process. Some mentors also deliver workshops and talks at schools and talent networks around the world. Last year, 71% of our applicants were accepted into one of their three top choice universities. Receiving a mentor is completely free of charge for applicants. Because the problem affects thousands of people each year, our solution aims to tackle it in a scalable way. We know that our mentors’ time is limited, so we do everything we can to design interventions alongside it that help applicants get up to speed on the basics of the application process. To do this, we’ve designed an online application Journey, which sends tailored information about the next steps every month. We also have a Curriculum with all the content on the application process in one place and a Knowledge Base for frequently asked questions . Our tools are designed for students who have been raised with technology in all areas of their lives. These tools are user-friendly, effective and intuitive for students to use. Regardless of who we work with, we will always put our applicants’ interests first. This means encouraging applicants dream big, but then helping them apply to whichever university they decide they want to go to. We carefully evaluate the effectiveness of our programmes and receive a constant stream of feedback from the students we work with so that we’re always learning and improving. 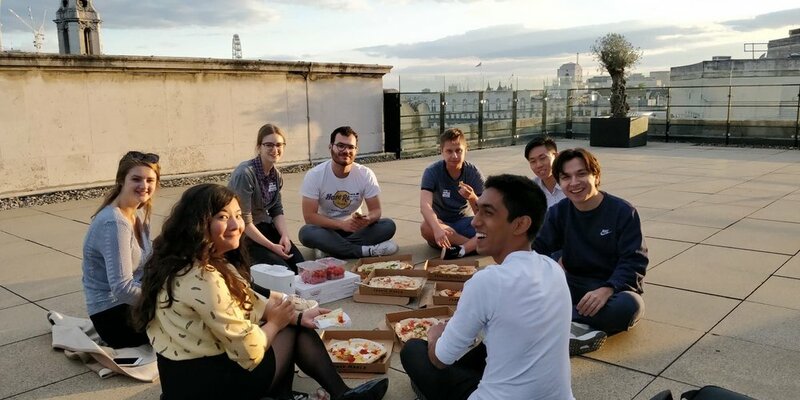 A campus team pizza social on the roof of our London offices. Evellina’s Story: Minna was an excellent and inspiring mentor. She really put an effort helping me achieve my goals. She supported, motivated, and assisted me throughout the application process. With her help, I got offers both from Oxford and Imperial College. I’m so grateful for her support. Project Access as an organisation was also an extremely important part of my application process. With the help of Project Access, the application process was actually nice and interesting instead of terrible and scary! For future applicants my top tip is to find inspiration that gives you enough motivation to go through the process. If this is what you really want, you'll get in! 2. Filling in the gaps. Klaudia’s Story: Despite my prior research getting in touch with my mentor was a really crucial element for me, as it gave me an insight into how I should prepare for my interview. My mentor organised several mock interviews and shared her own experience with me. She also held an interview with her another mentee and me, which was very useful too. When the time for the interview came, I felt confident and well prepared because of her help. I also got along very well with my mentor and I hop we can become friends next year when studying at the same university! Project Access is a great initiative which helped me to get into the university of my dreams. Emily’s Story: I’m from a semi-rural village in Derbyshire. My school was relatively small as a whole, with a small sixth form. The staff were as helpful as they could be, but didn’t have much experience of sending pupils to Oxbridge. Project Access was so important to me as it allowed me to feel that I could even accept my offer. I was so worried about the misconceptions of Cambridge and that I wouldn’t fit in, but the stories in the monthly modules and talking to mentor dispelled any myths I had. Also, the revision tools Project Access provided to be for free were key. The subscription to these normally is very expensive, and I couldn’t have afforded it. They were so useful and it was almost like having your own personal tutor there. Project Access can help top universities dispel the myths around their reputation as it gives offer holders and prospective applicants to really scratch below the surface of that an institution is like. Open days and short events can only do so much, but a sustained period of contact with a student there is invaluable for helping you realise the people at the university are ultimately just like you! Get in touch if you like what we do, have a question, or want to talk about ideas for how we can improve. We’re always keen to get new input and impact partners. Project Access to Top Universities is a registered charity in England and Wales (1175679).